What is a Cage Mill and How Does it Work? Invented by Nathan P. Stedman, a cage mill is an internally fed impactor that crushes grinds or pulverizes many different materials to specified degrees of fineness. Early cage mill crushers were used principally to crush materials that were not particularly abrasive – corn, salt, coal, clay kaolin. By 1900, Nathan Stedman had built more than 100 cage mills. After its invention, numerous applications were discovered and soon cage mills were used for crushing chemicals, clay and fertilizer materials. It wasn’t until the 1930s that the true value of cage mills as an agricultural limestone crusher, a size reduction mill and beneficiation was realized. Cage mills can be configured in two, four, and six row designs, each with their own unique crushing applications. Stedman’s range of multi-cage mills and pulverizer machines includes the H-Series, F-Series for sticky, high moisture and Y-Series designed for less abrasive material applications. In general, the larger the cage mill, the larger the feed size it will accept and the greater capacity it will produce. Capacity also depends on upon the speed at which the mill is operated, the feed size and its specific gravity, and the size of the desired product. Cage mills work by reducing the material they are fed to predetermined smaller sizes by striking repeatedly with cage pins and throwing the particles at high speed against each other, against the cage mill housing and against the other pins. Single-row mills, although normally classified as secondary crushers, are designed for heavy-duty crushing, frequently of hard and highly abrasive materials, although their versatility makes them valuable for the reduction of many kinds of materials. They are particularly useful in the beneficiation of sand and gravel and in the upgrading and crushing of all kinds of aggregates, ores and coal. Multi-row mills normally consist of an even number of cages: two, four or six. The cages are arranged concentrically, with each cage spinning in the opposite direction from that of the cage adjacent to it. A multi-row cage mill employs multiple stages of selective impact reduction. The material to be reduced is fed into the center of the innermost cage, where it is struck by the massive spinning pins and distributed 360 degrees around the cage. Centrifugal force and the impact of the pins causes the material, now reduced to smaller pieces, to pass through the cage into the pins of the next cage, which is spinning in the opposite direction. The farther away from the center cage the particles travel, the more their impact velocity is increased. 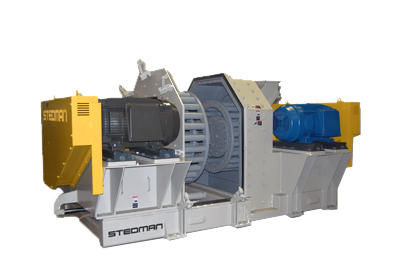 The Stedman H-Series™ multi cage mill is best at pulverizing, grinding, crushing and mixing abrasive and non-abrasive materials – wet, sticky or dry. The F-Series™, or Flared Series, Cage Mill features a unique flared discharge opening, efficiently reducing the wettest and stickiest of materials without clogging. The Y-Series™ is a selective crushing, controlled-impact, multi-cage mill designed for sizing thousands of minerals and agglomerates, including wet and tacky materials.